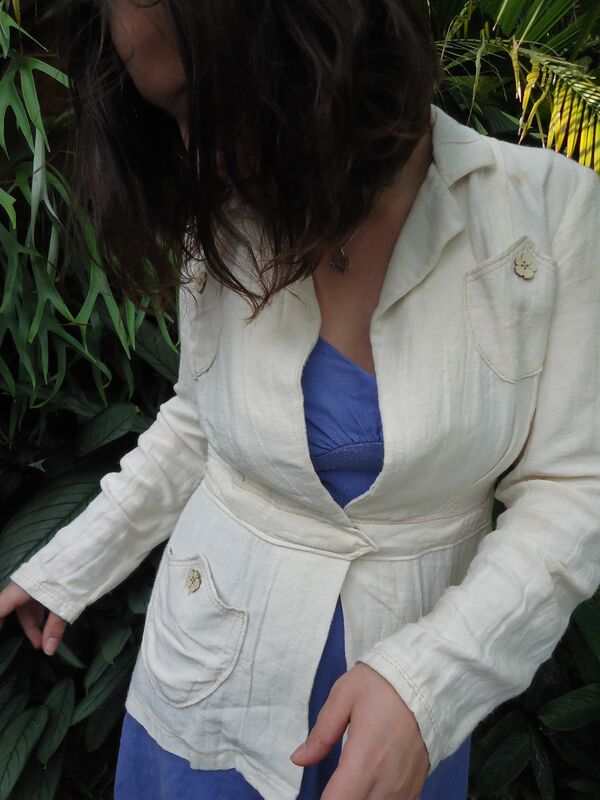 I started sewing this unlined jacket in a hemp-silk crepe satin for the vintage pattern sewalong last January. 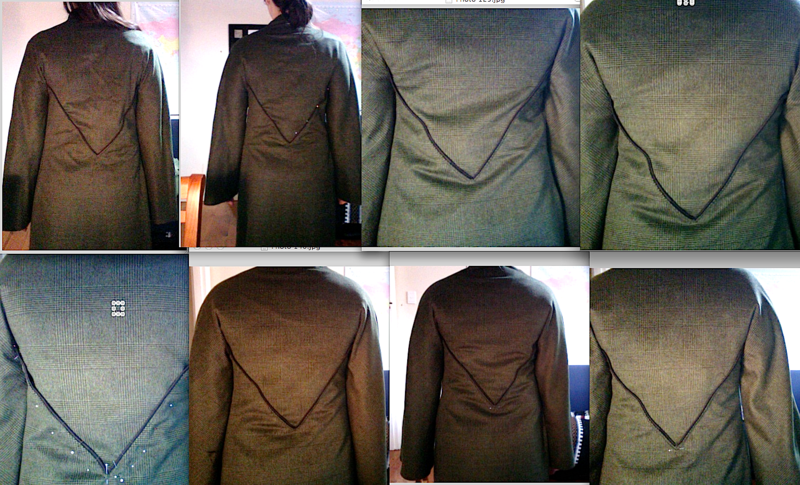 I carefully altered the pattern using another pattern that fit well. 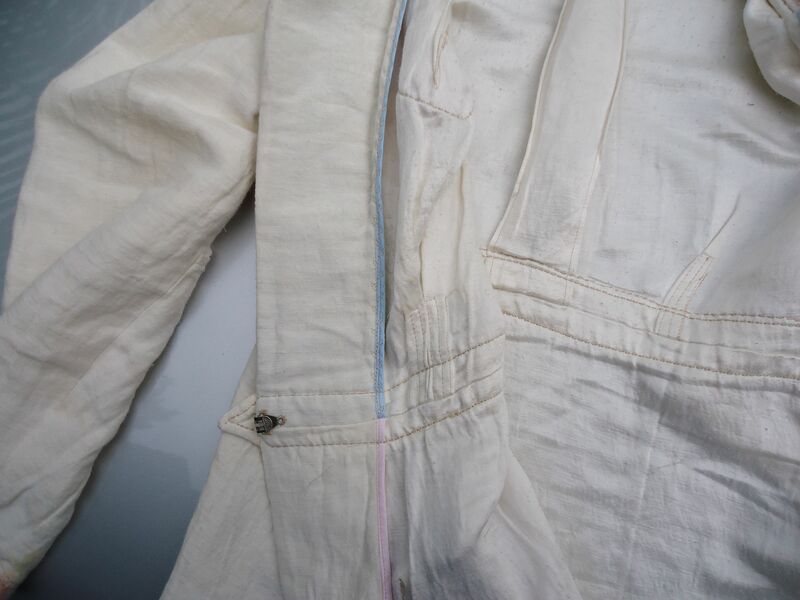 Then I obsessed over engineering the patch pockets so they would withstand hard wear and summer conditions. 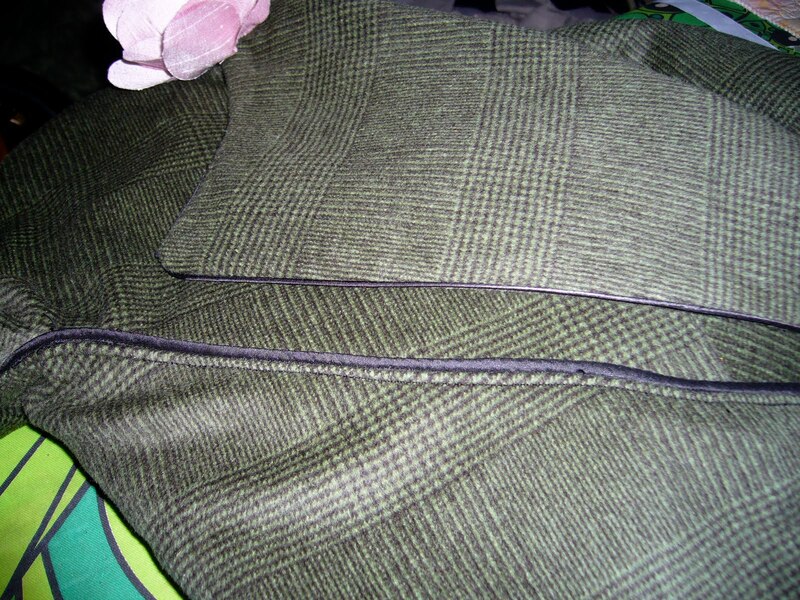 Finally, I played with several types of saddle stitching to secure the design details. All in the course of two weeks. Then I stopped. 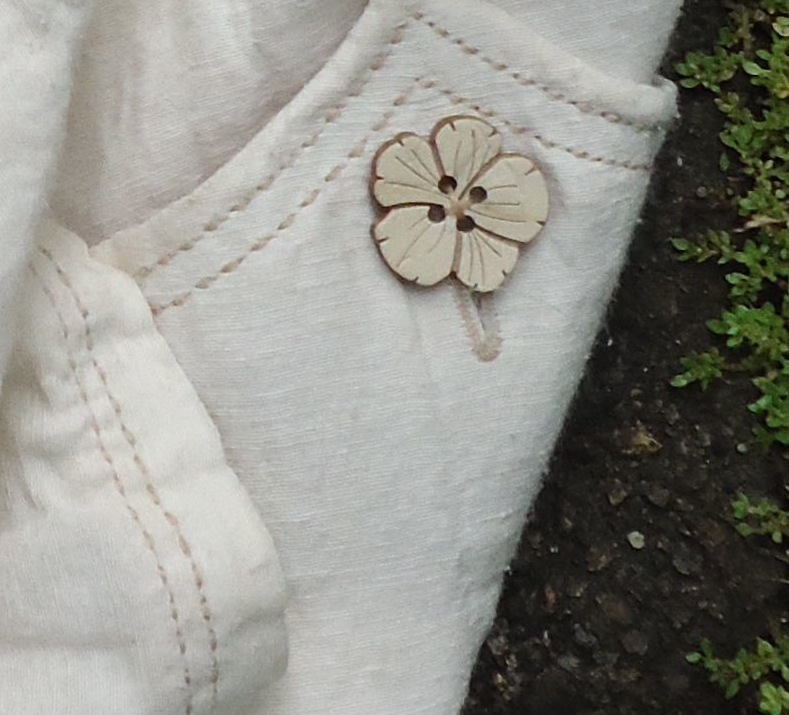 I just did, we ran out of summer before I found buttons I liked. 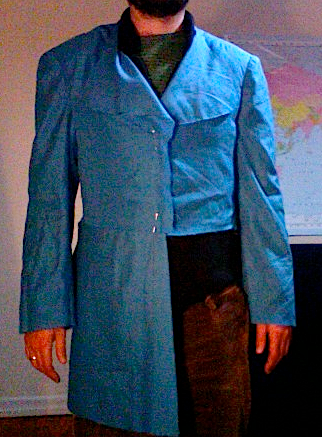 I made another version of the same pattern in corduroy for winter, which became my favorite jacket ever. 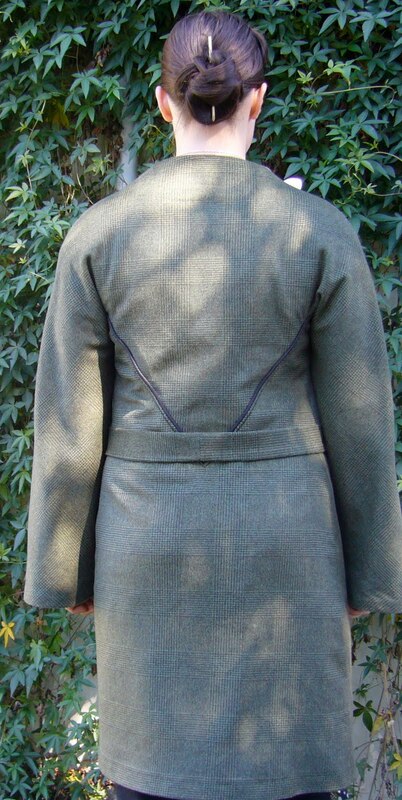 I like the way the back pleat “settled in.” I was careful to stitch each dart, tuck and pleat into place so I could easily launder the jacket and the details would retain their integrity. It works well. Here’s a peek at the inside construction. 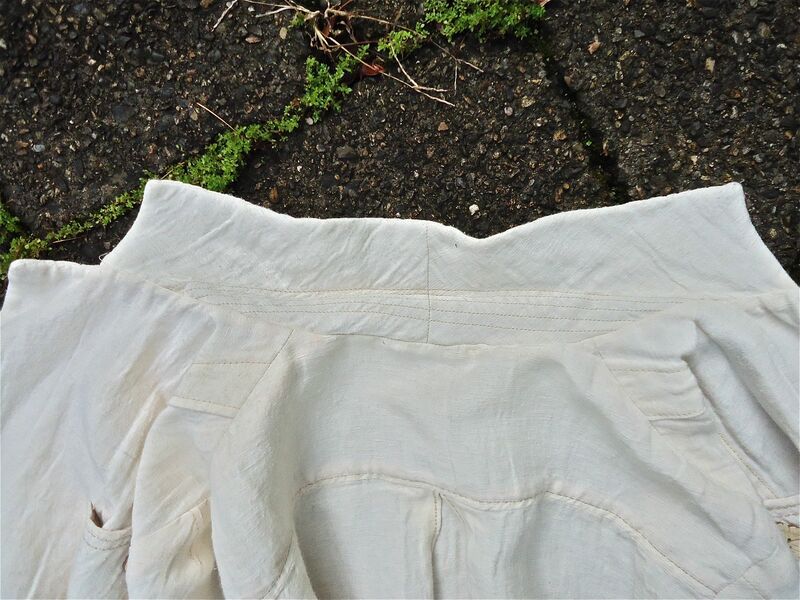 The satin side of the fabric is on the inside, where it slips against my clothes and skin. The rough, textured crepe side faces out. 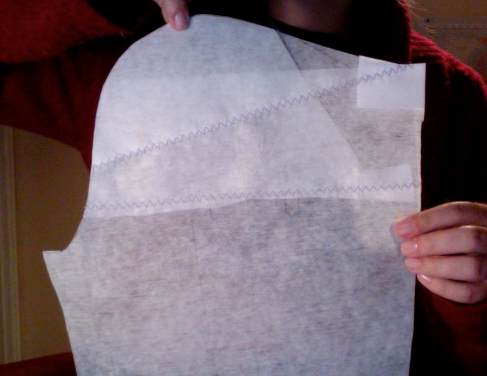 The texture repels soiling. 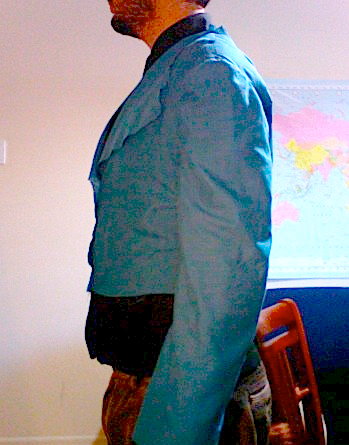 I wanted this jacket to be tough above all other considerations, and easy to launder. 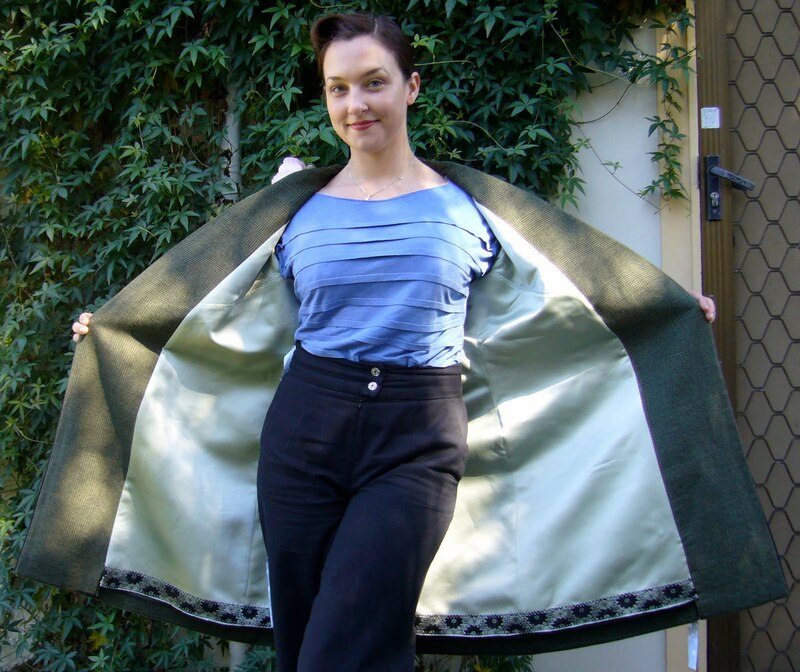 I used haircloth interfacing, bound all the edges with pink and blue satin bias binding, sewed the waist seam “inside out,” then covered it with a belt feature. 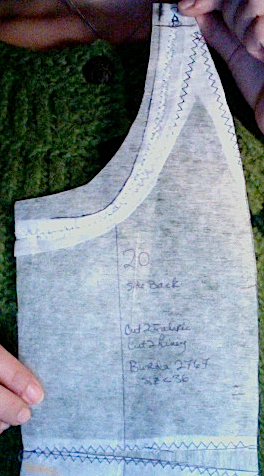 I stitched the collar “stand” so the long-wearing collar would stand up well to abuse and because the very old pattern told me to. I thought it sounded reasonable. 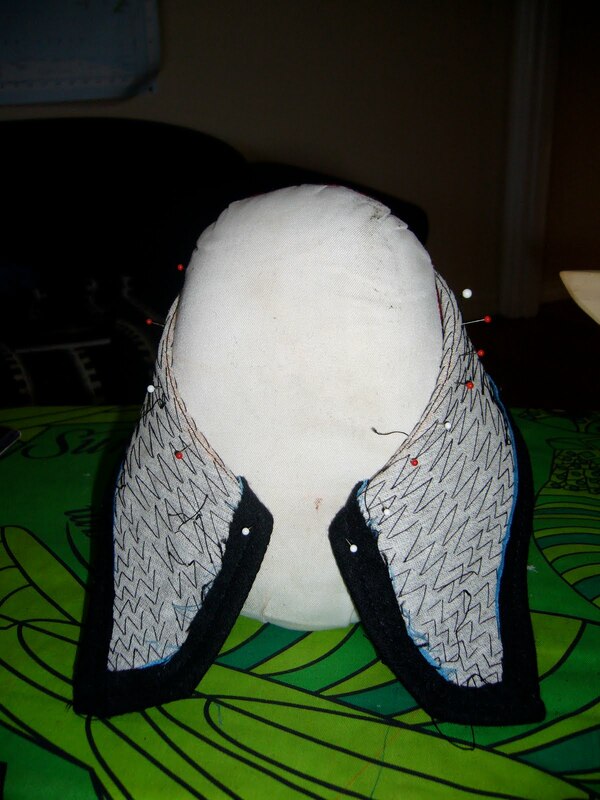 I plan to do another collar like this, because it is AWESOME; I’ll document the process when I do. 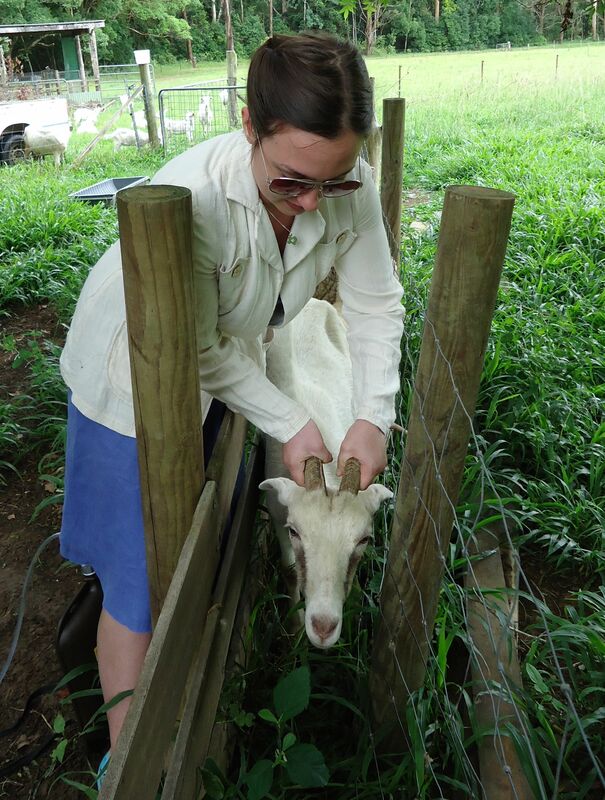 I wore my jacket this morning while I helped out on my husband’s parent’s farm. 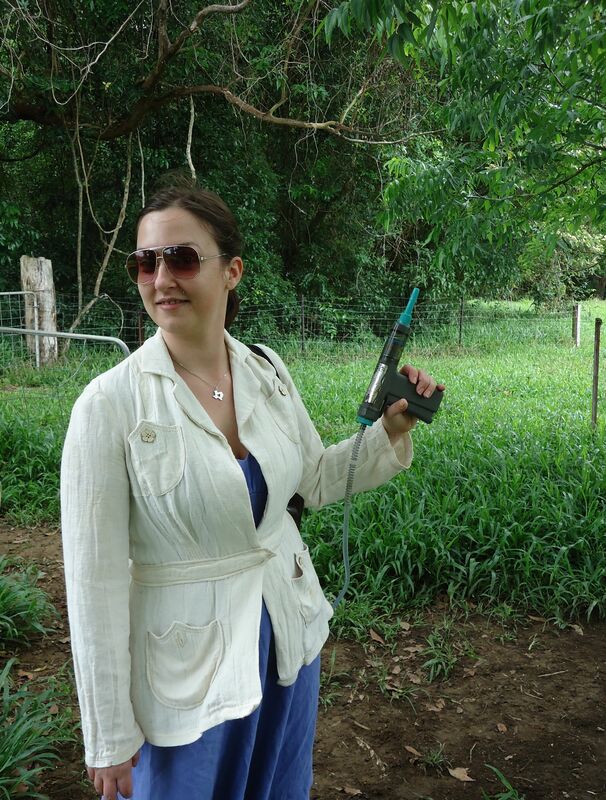 This is a medicine gun, attached to a medicine pack slung over my shoulder. 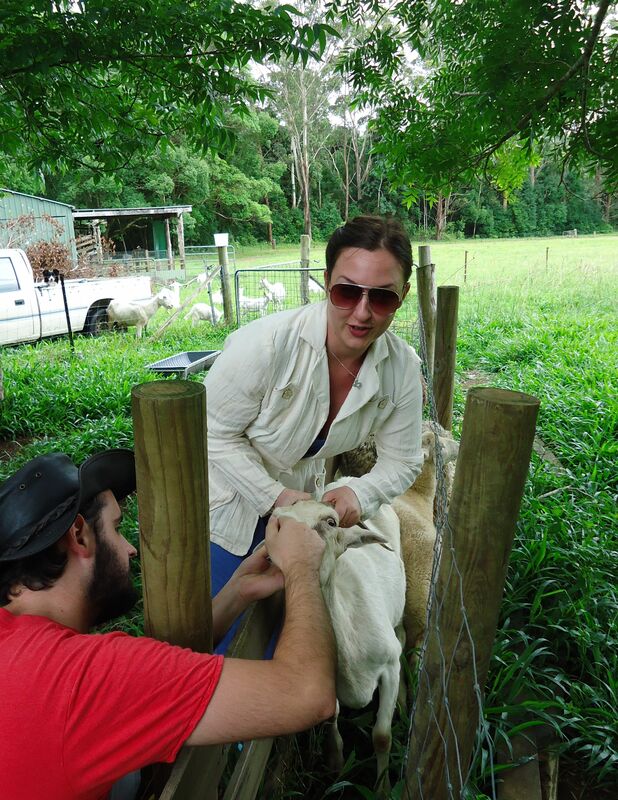 We were worming a paddock of sheep and goats. So it could take its medicine. 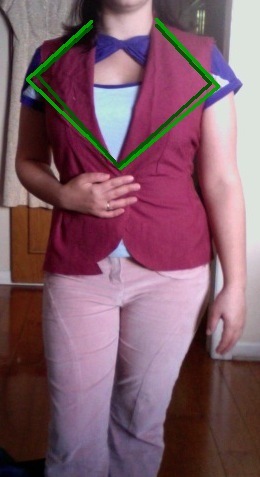 I used four buttons on the pockets from a dead 30’s blouse I made pre-blog. My brain tells me they’re tacky, but I love them and I’m delighted they’re a part of my wardrobe again. 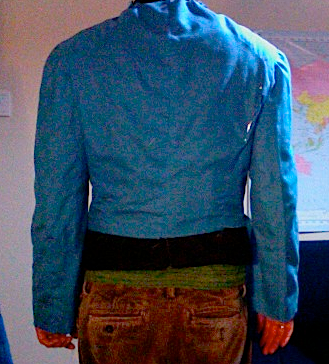 I finished the front belt with a trouser loop and bar. 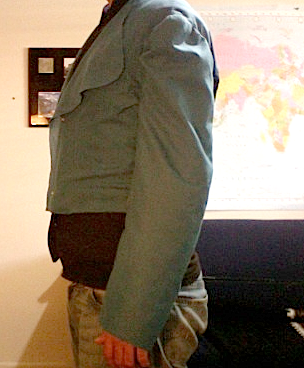 Honestly, this jacket doesn’t need buttons down the front. 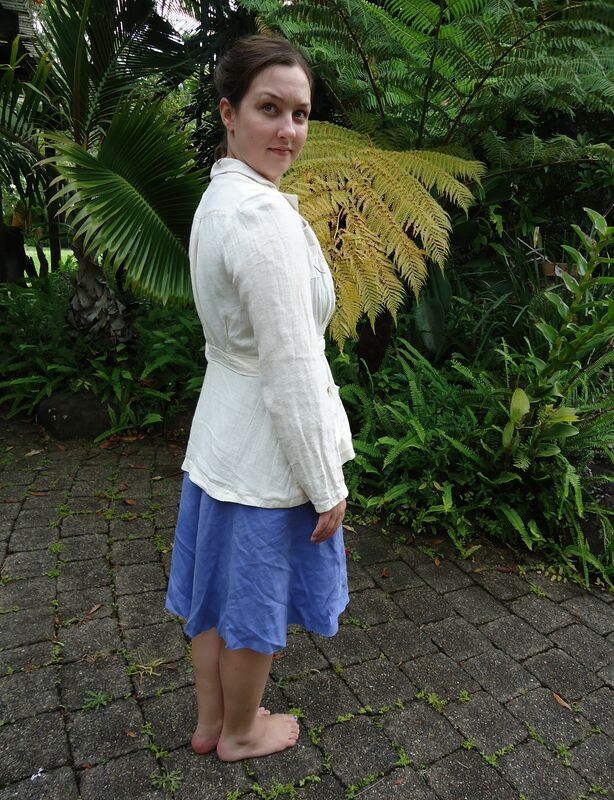 My source for hemp-silk is in Perth- Margaret River Hemp Company. It’s truly delicious fabric, though a trifle “wiggly” to work with. They have excellent customer service. Maybe it’s the cool, cloudy, unseasonable weather, but the whole world looks to me like it’s erupting into brilliant Christmas colors. Everywhere I look, I see vibrant reds and greens. The banner now is a “flame tree” at the foot of the orange orchard on the farm. I hope you don’t mind me sharing such non-tangible inspiration; I plan to keep up the red and green photos through the holidays. It’s my small way to acknowledge Christmas. Robin goes to the first day of her “big girl” job. WANT. The inverted Hong Kong finish on the CB seam first caught my eye. As I rewatched in slow motion, other details sufaced. 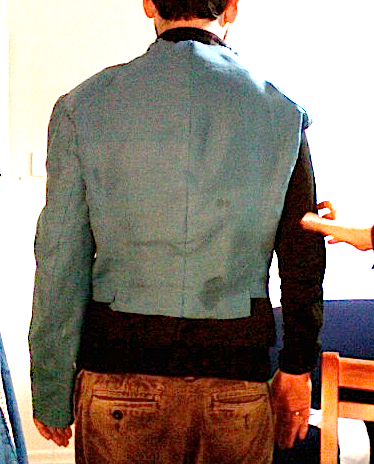 Someone cut that jacket on both shoulder and armhole princess lines. The seams look felled. 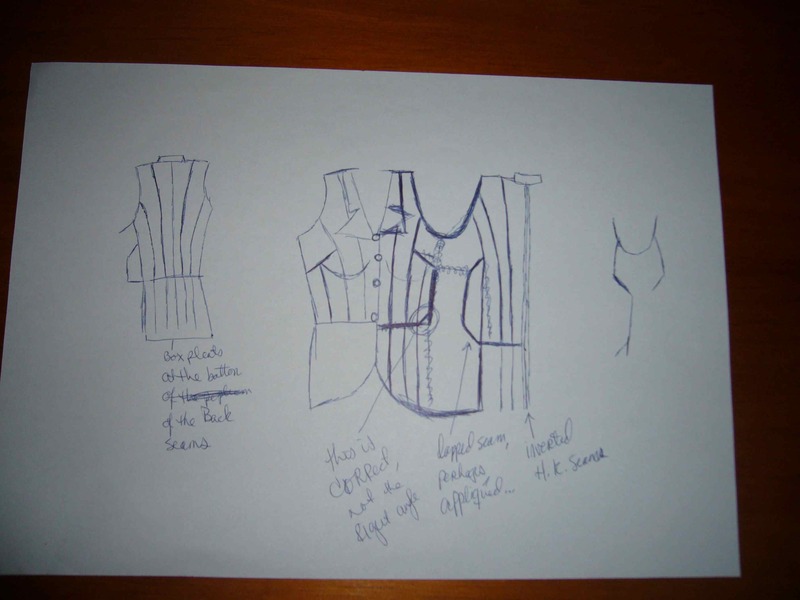 I like the pleated back peplum. But wait, there’s more! 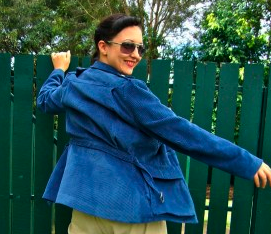 The back inset allows the strong windowpane stripe to wrap around her body smoothly. Very cool. Then I saw the Hong Kong seamed panel on the side fronts. 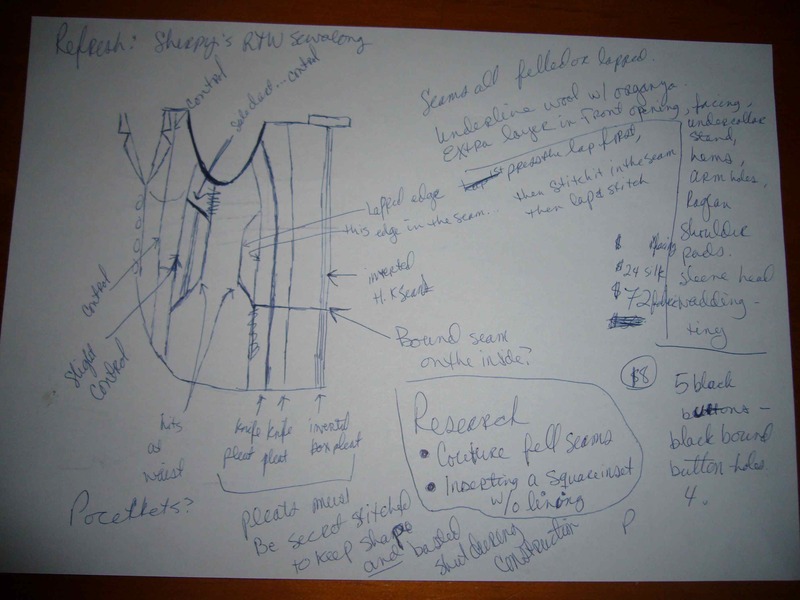 I began to scratch out a line drawing to plan my drafting. 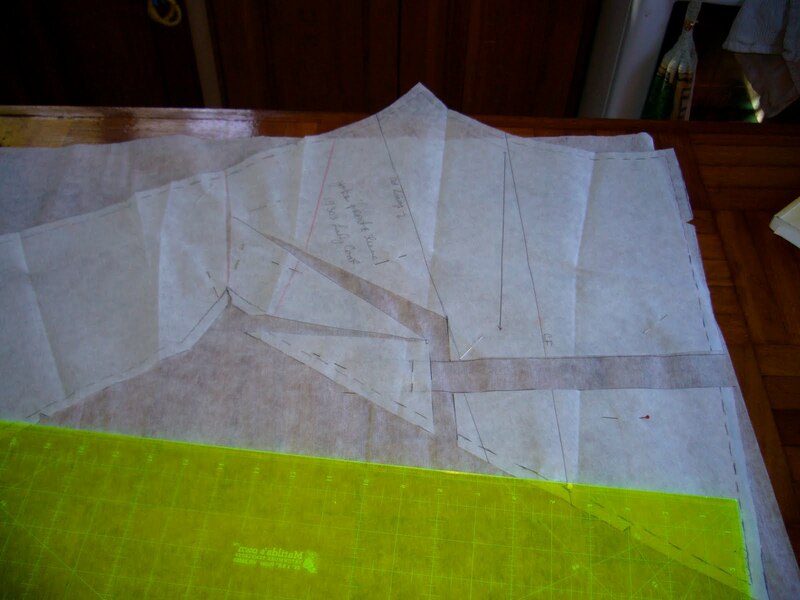 Once I figured out the lines, I began to ponder how it should go together- also how best to balance and place the seams. I listed necessary materials, equipment, skills, research, questions. 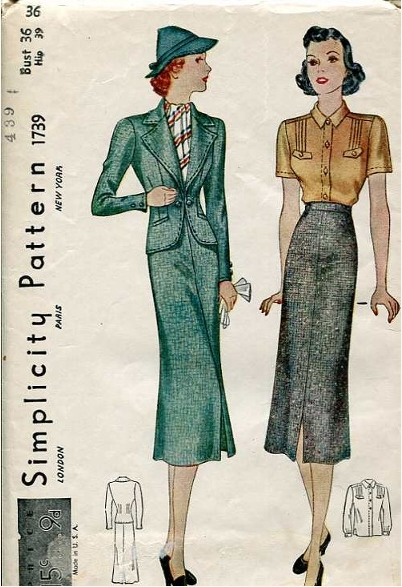 I need to leaf through Roberta Carr and I want to refresh my memory over at pattern~scissors~cloth. Material? 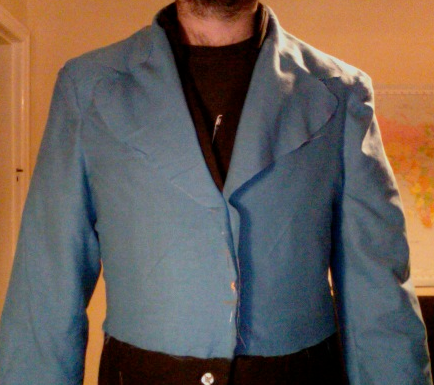 Well, I fear this charcoal tropical wool is not destined to be a Moderne dress but a suit. 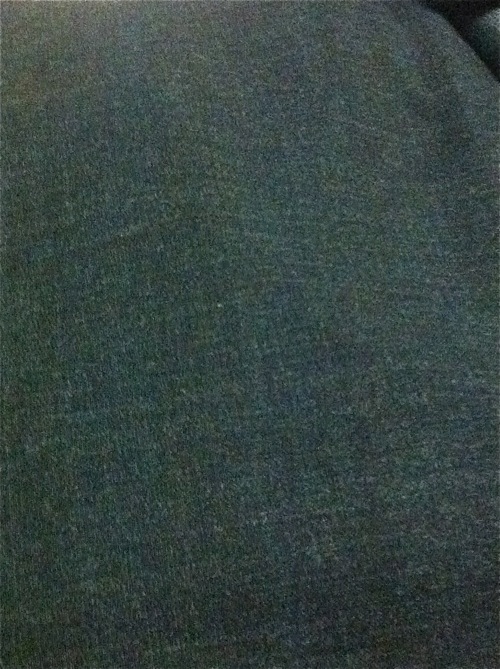 I may manage a skirt and trousers for the jacket from this fabric. 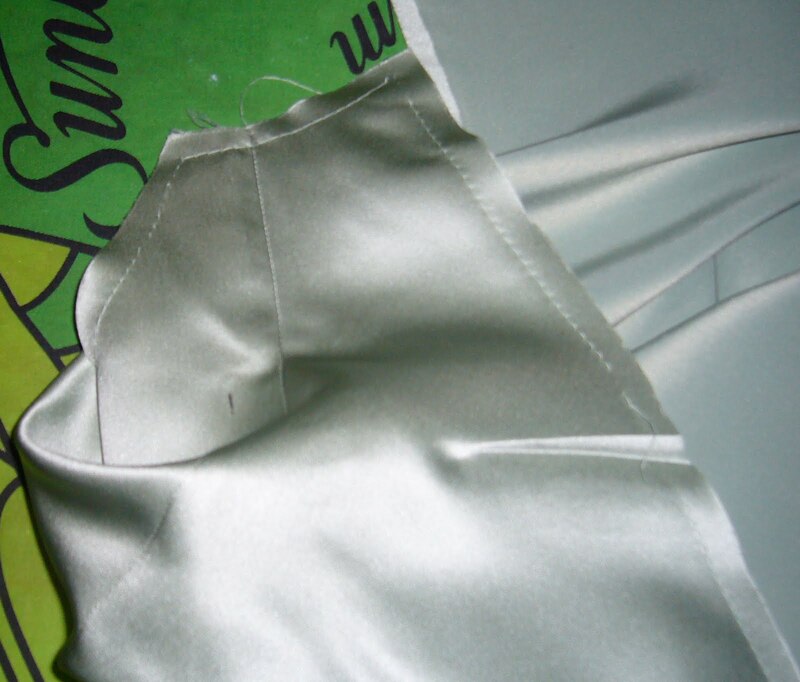 I plan to underline the suit with silk organza and fell most of the seams. 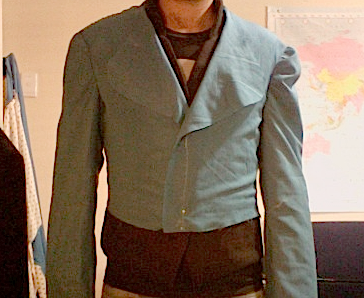 I think it will lend gentle structure to the jacket. 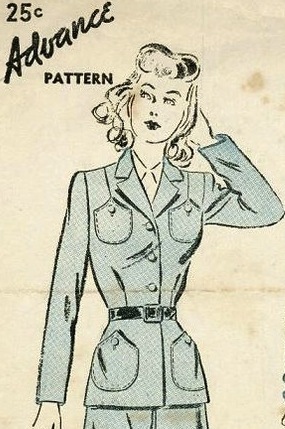 Pockets? 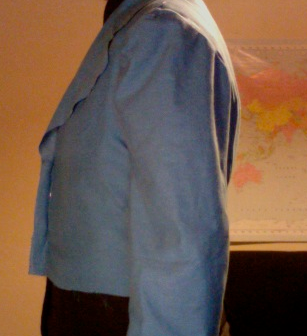 I hadn’t thought to put a suit into my Summer 2011 wardrobe (I thought I would have no time for it! ), but now I can. And must. I need a “big girl” suit like Robin! Pine Swamp, much like where I grew up. 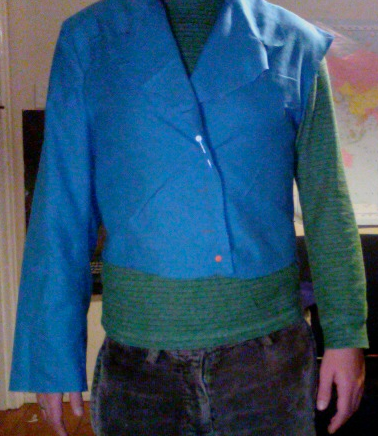 The colors remind me of the fabric I used. 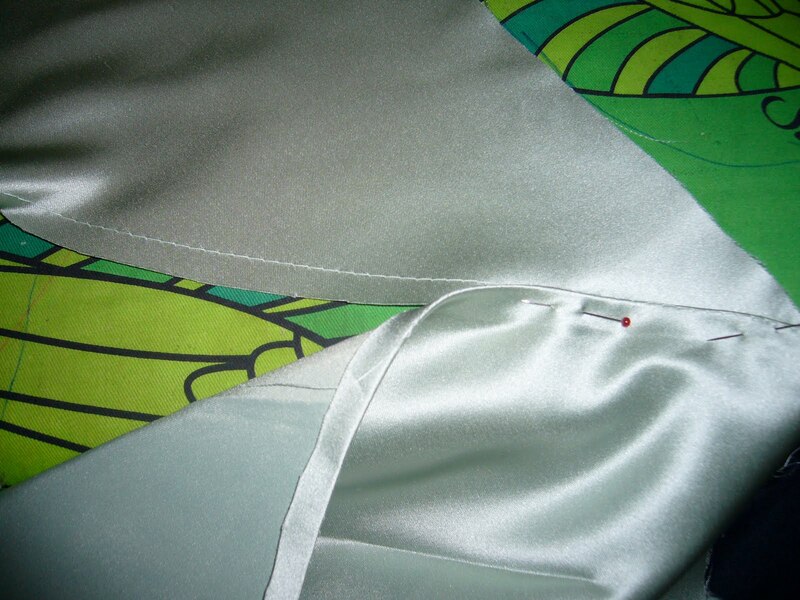 The scent of the fabric reminds me of a clean cat. I miss cats. I miss pine swamps. I think I made too much FBA. 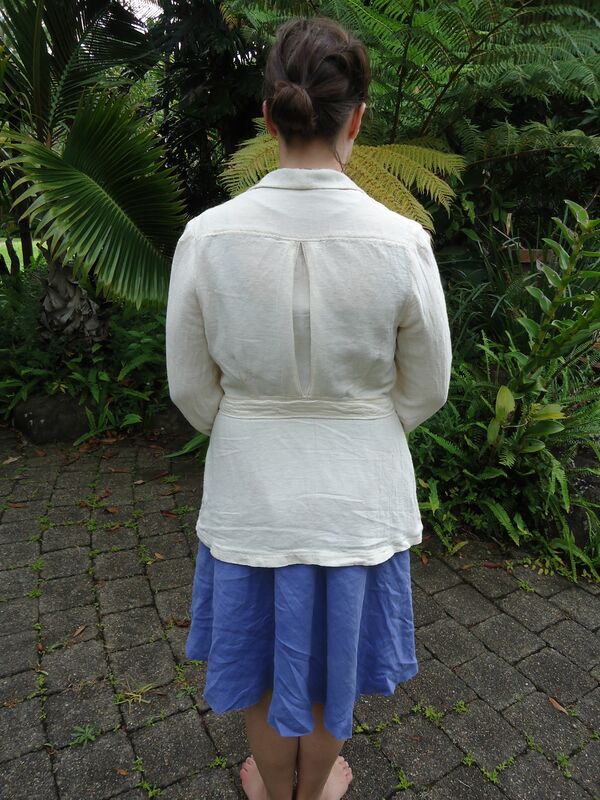 Rather, when I made the FBA, I couldn’t figure out how to make the yoke piece fit onto the skirt piece. 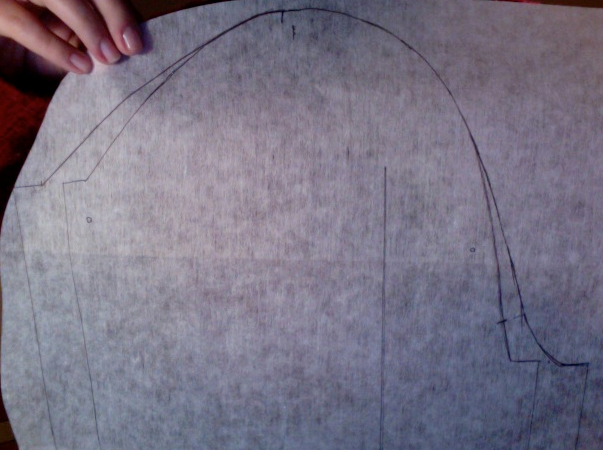 That’s why I have little gathers in the front when I cinch the belt, and why the side seam swings to the back. I rotated the little side dart out to make the center opening wider. 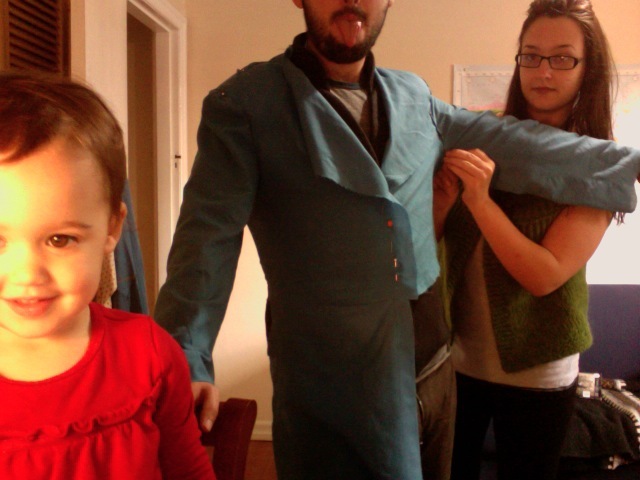 In retrospect, I ought to have kept the little dart, I think it would make the coat fit better. 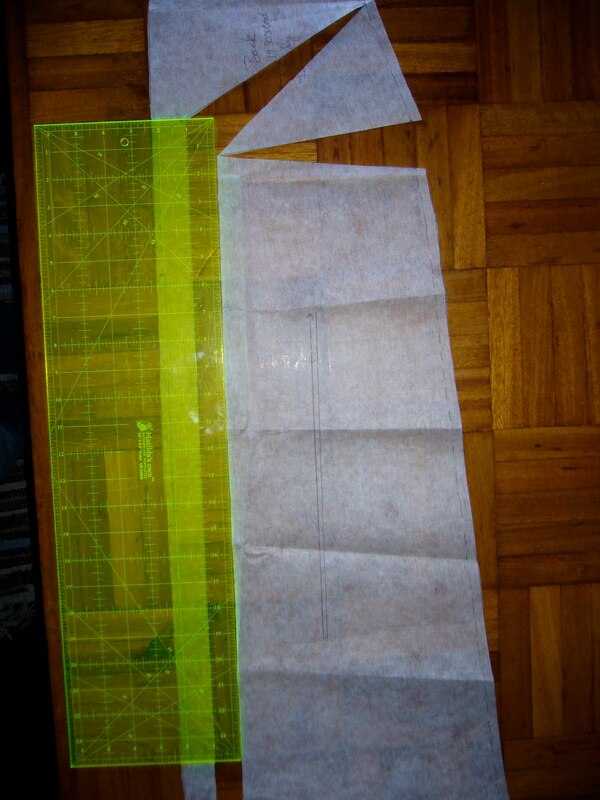 To make the skirt fit, I slashed and spread. 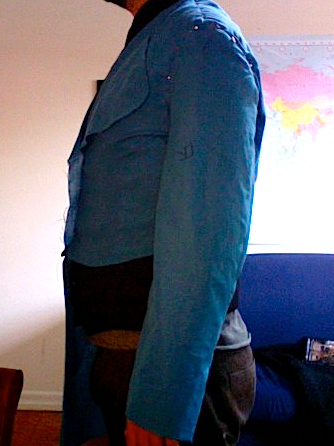 That was fine, but the finished coat could stand to be taken in a little on the sides at the waist. It’s huge on me! 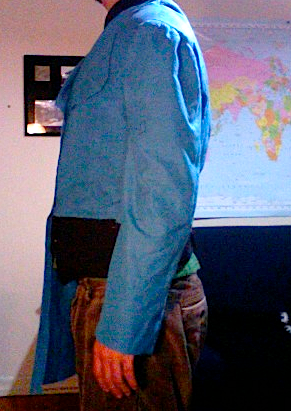 I know coats are meant to be, but this actually gets gathering folds when I put on the belt. 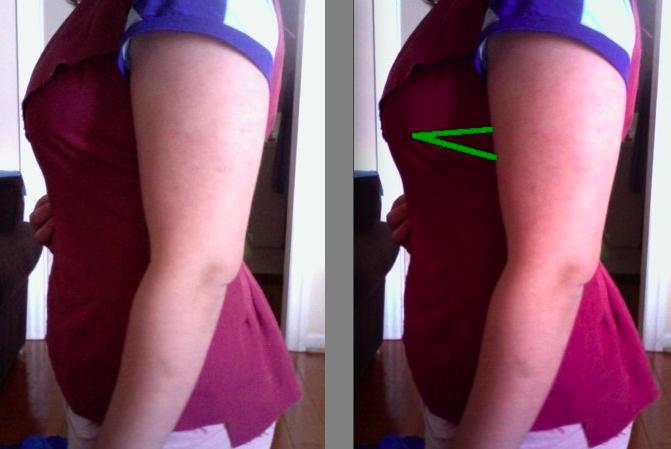 Interesting note, the FBA cured all the bicep fit issues. My arms slide right in and out with no trouble. It feels divine to wear. 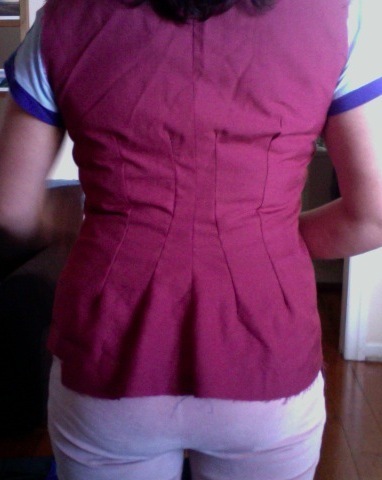 Confession time: I made this without practicing first. 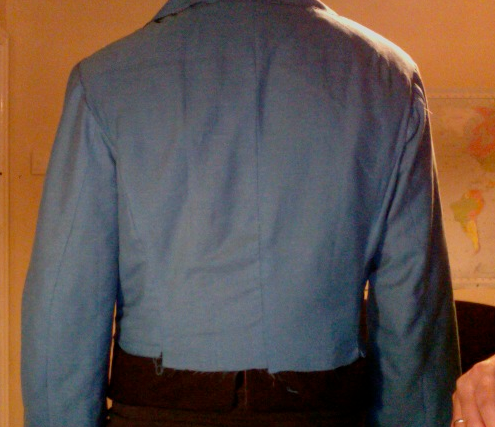 I hate spending all that time to practice, only to have a perfect pocket after several hours of work. I’ve been making piped welts and single welts lately, so I just went ahead. It turned out nicely. 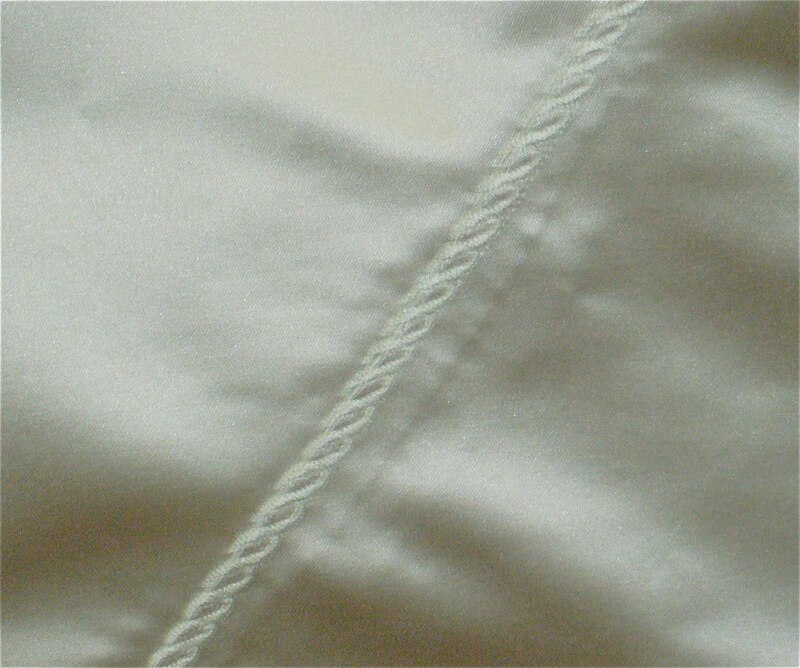 Same silk as used for the piping. 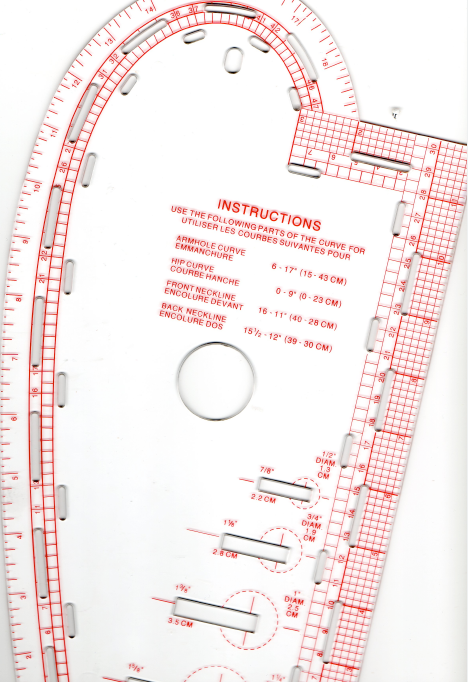 The instructions in the book have you flipping between several different pocket instructions, so tackle this one once you have a few welt pockets under you belt. 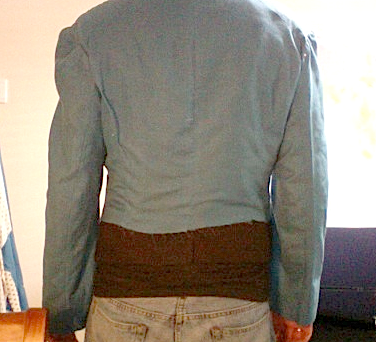 The back caused no end of grief. 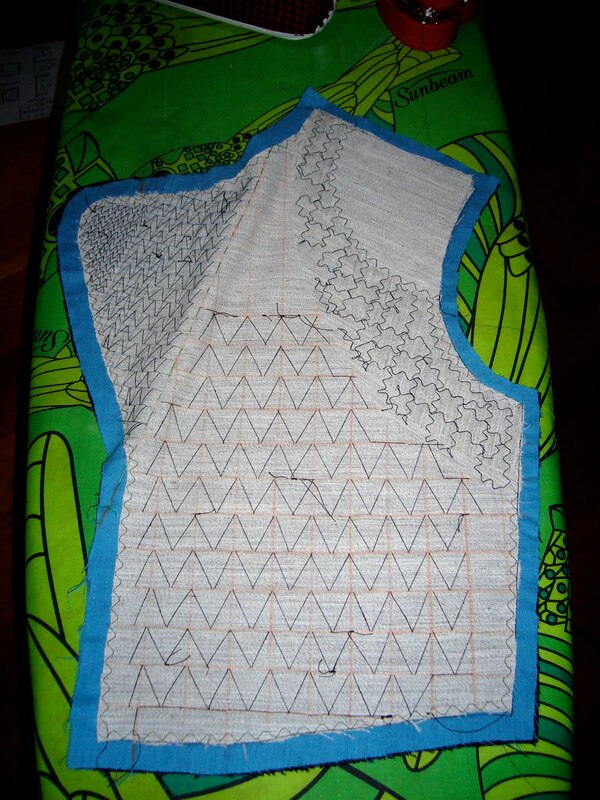 I piped, and started sewing the yoke-to-skirt seams conventionally. 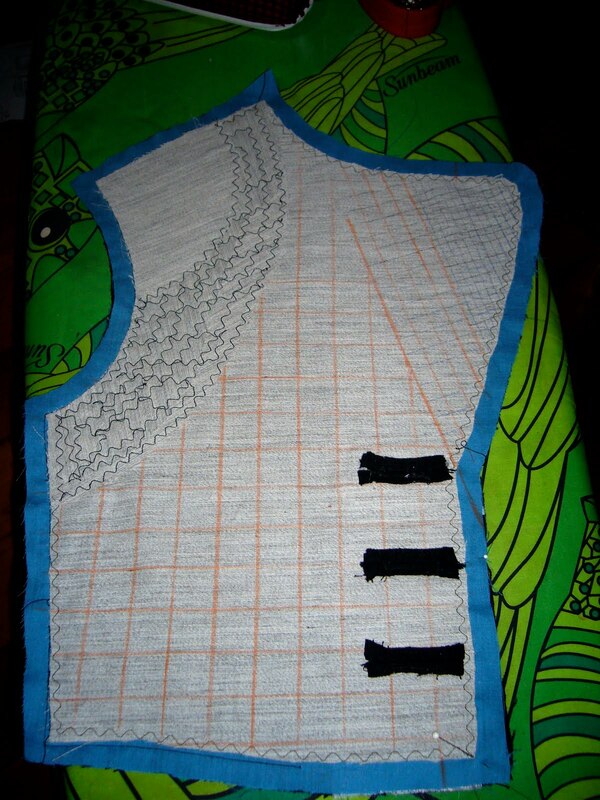 For one, the piping likes to draw up the green fabric. 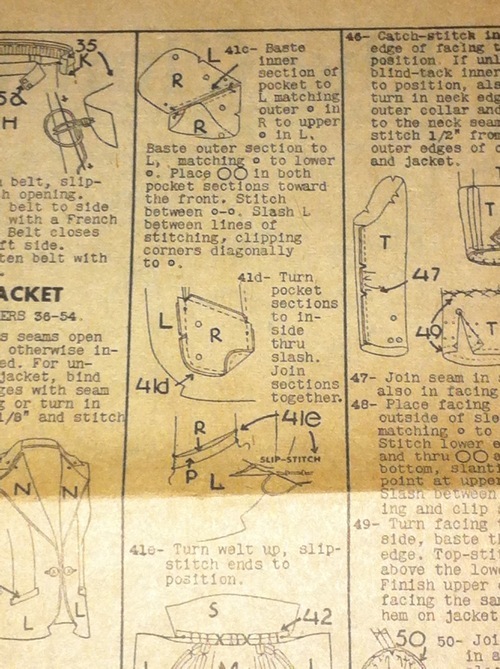 For the other, the instructions (such as they are) explicitly call for lapped seams. 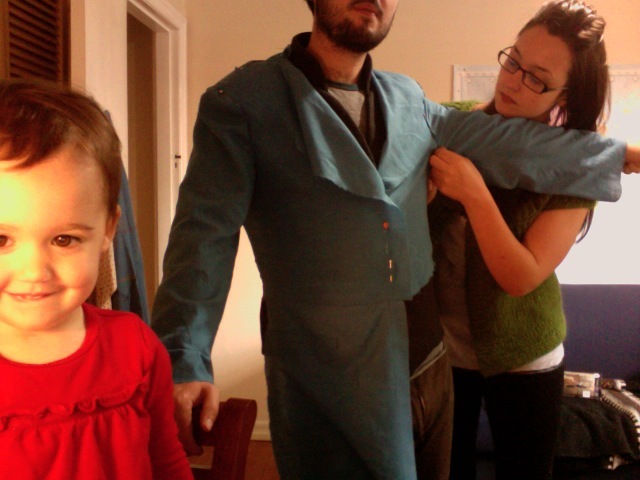 I ignored it, but after a few days of wrestling with seams I unpicked everything. Piping, all. 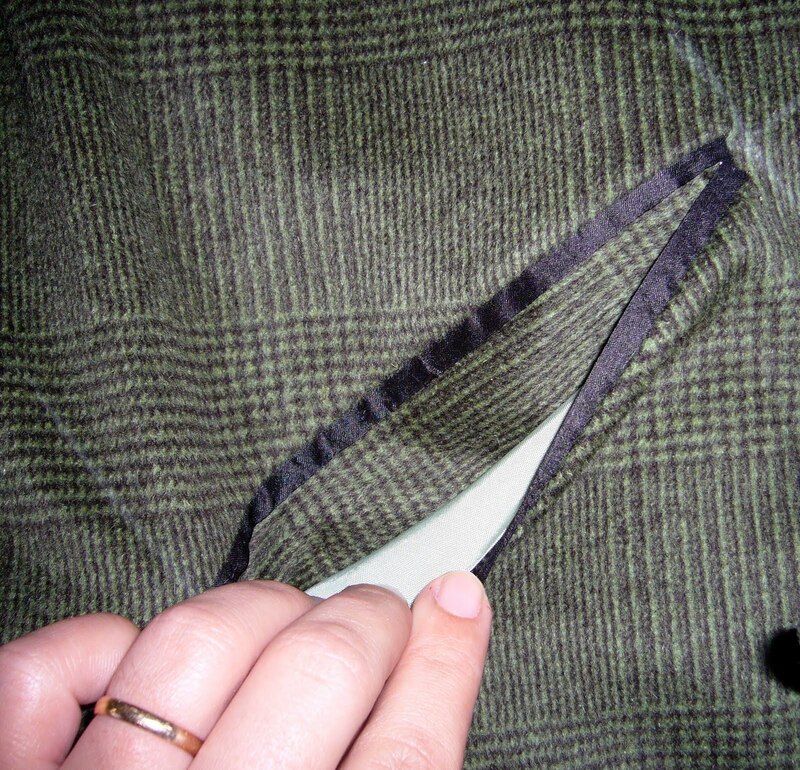 Then I made a lapped seam, prudently basted. 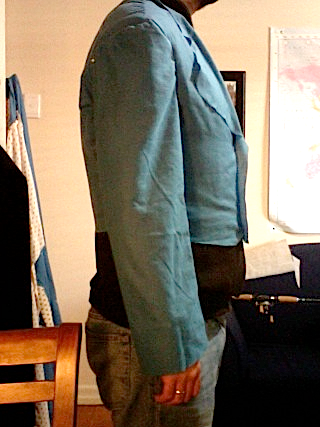 I re-positioned that seam more times than I can count, I took snapshots to gauge my progress. 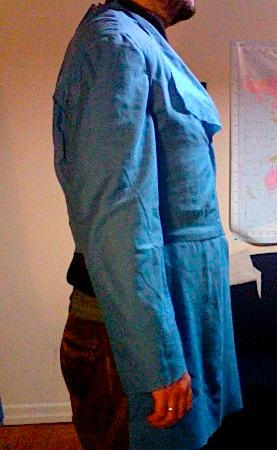 Black Dupioni silk piping I had on hand from anther project, thick and thin. I didn’t have to make any! 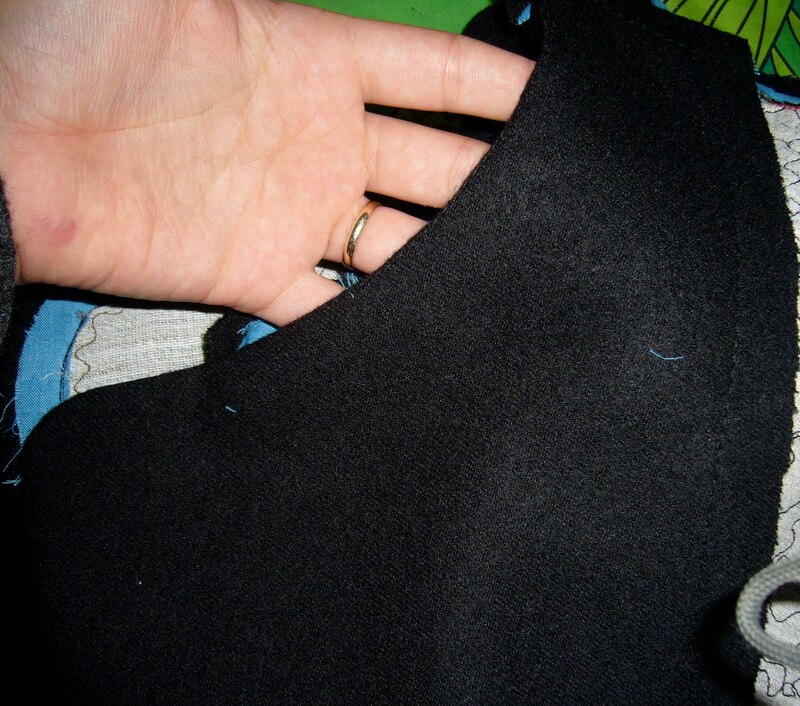 I basted, then stitched the seam with a triple top-stitch, then stitched again in the crack between the piping and the body. 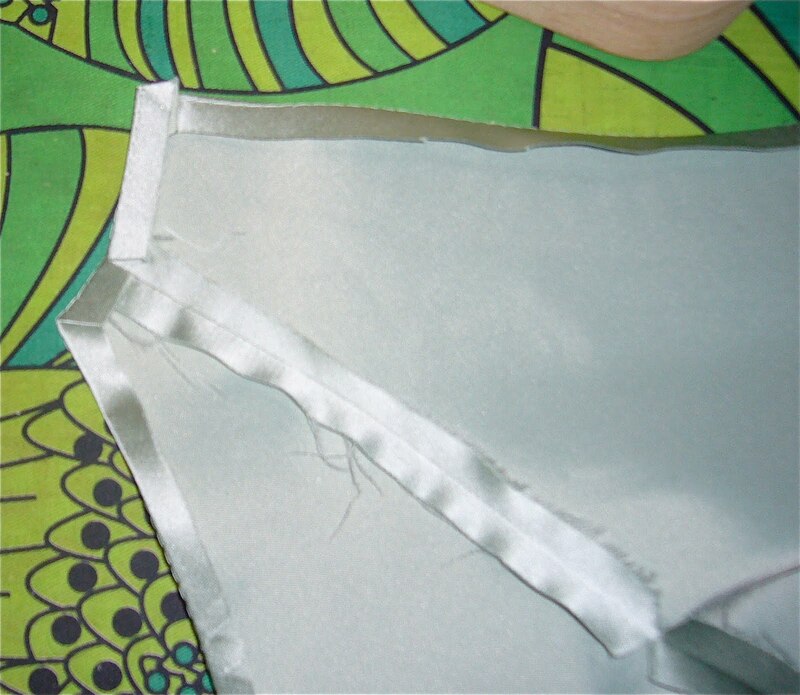 Mark both seam lines. I find it most helpful and accurate to mark with some basting. 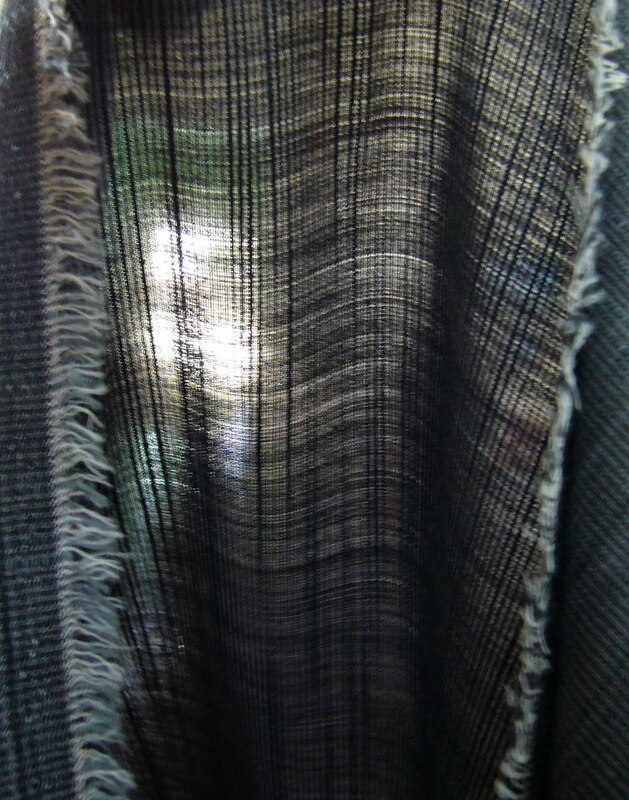 Press under the seam on one side. 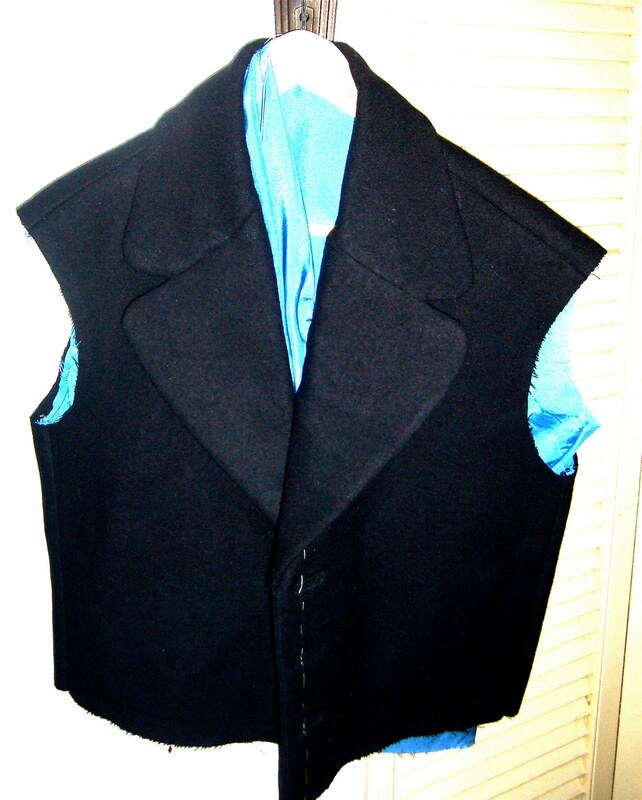 This is the lower- I lapped the lower over the upper. Pin. 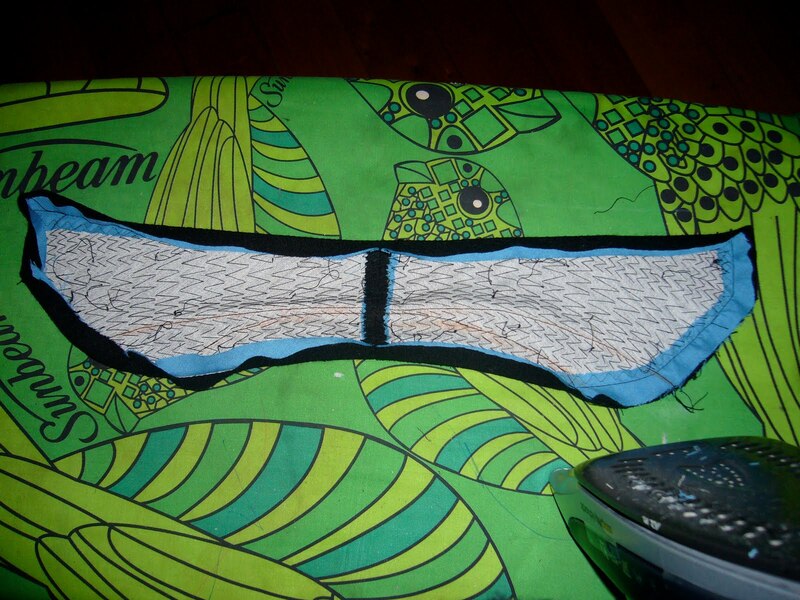 I usually pin perpendicular to my sewing, but this is a special case. 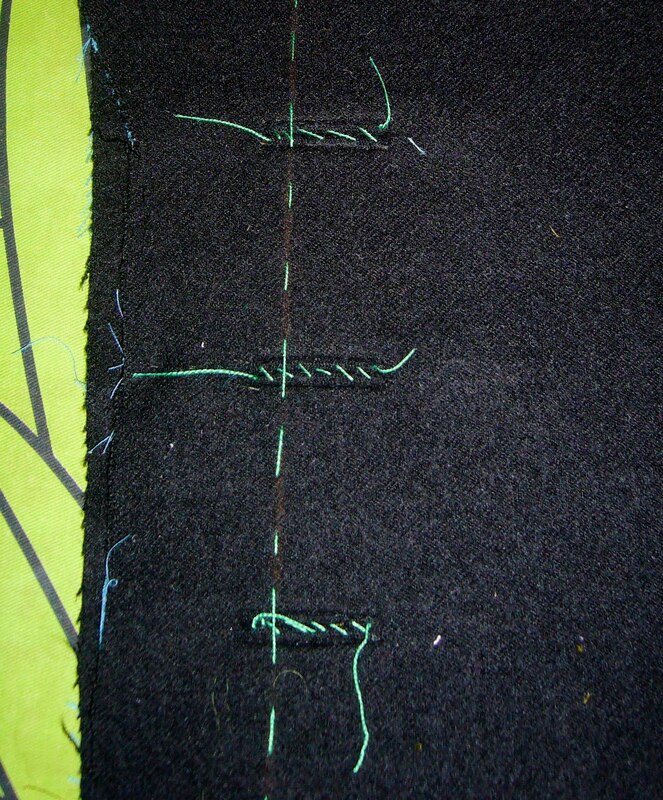 Sew, then edge stitch. 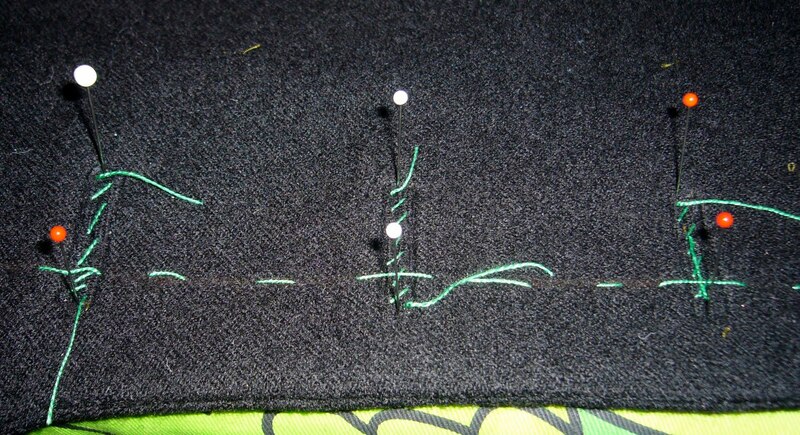 I used a pretty decorative stitch on my machine to stitch over the lapped seams. 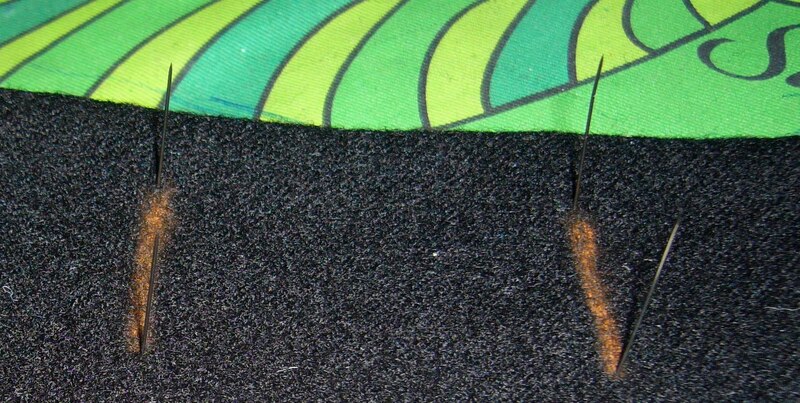 They slipped around a little with the straight stitching- ugly. So I covered up the ugly. 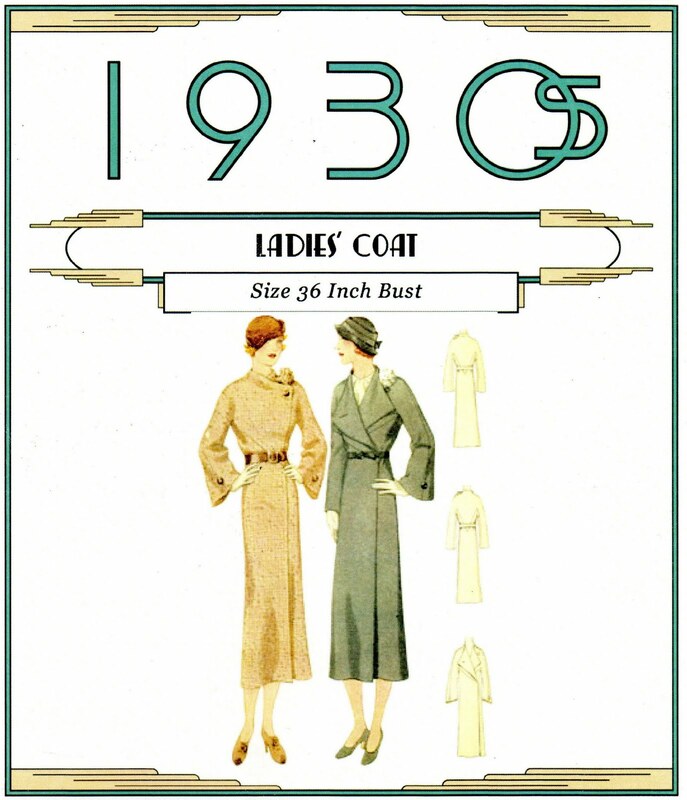 This seems a utilitarian tribute to the original gown’s tone on tone embroidery. Remember the hideous party filth on the old hem? 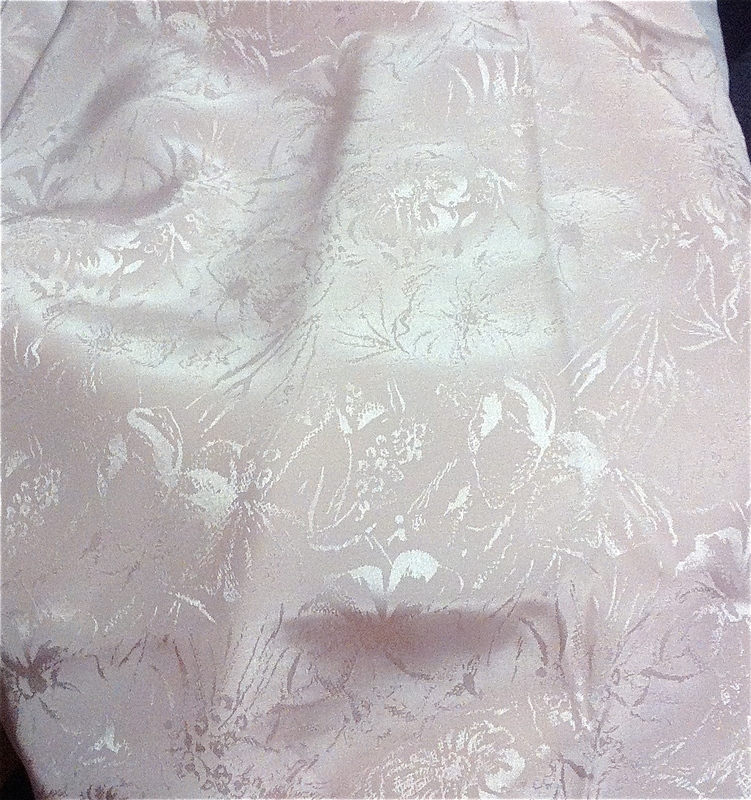 I couldn’t get it out, decided it wasn’t worth my time, so camouflaged it with some lace. 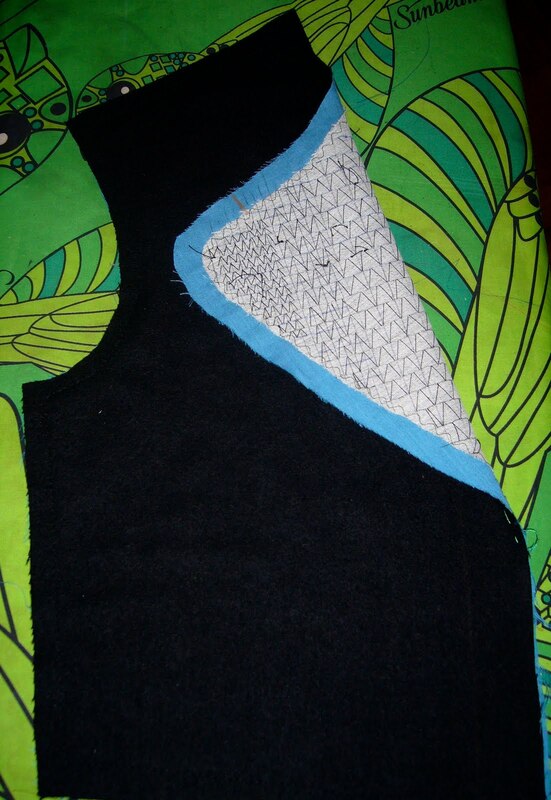 I had fleeting thoughts of finishing the edges of the lining for a dressing gown. 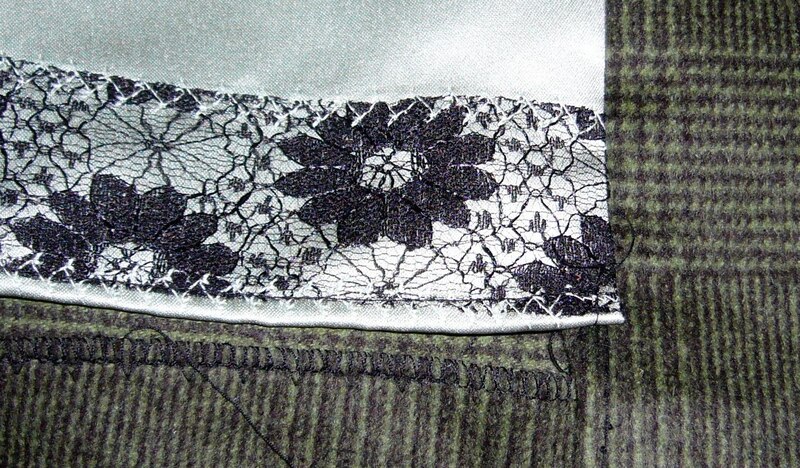 I love pretty linings. 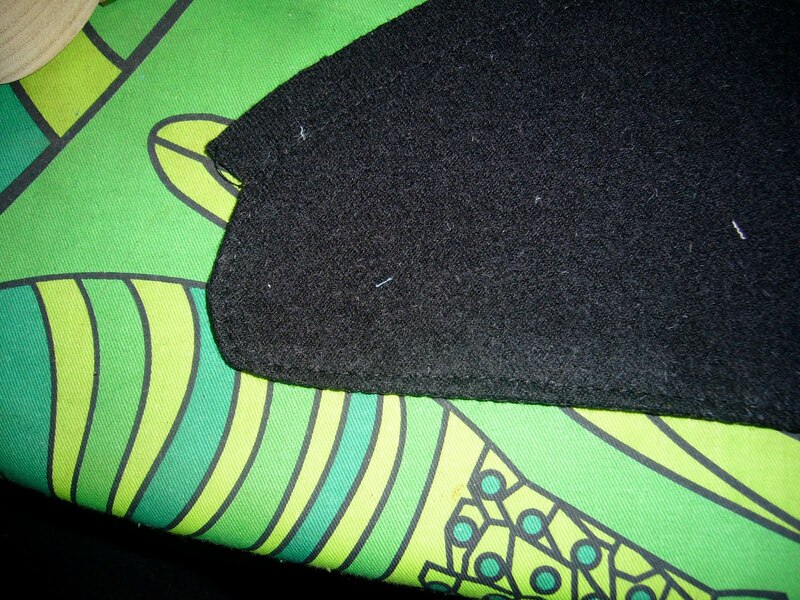 Not the nice interfaced jump hem I envisioned, more a simple tidy finish. 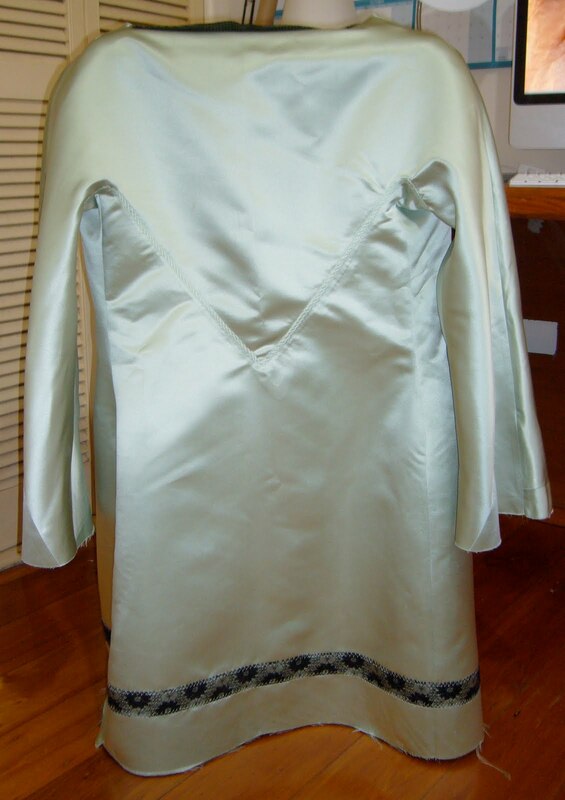 I might change the hem, but not now. 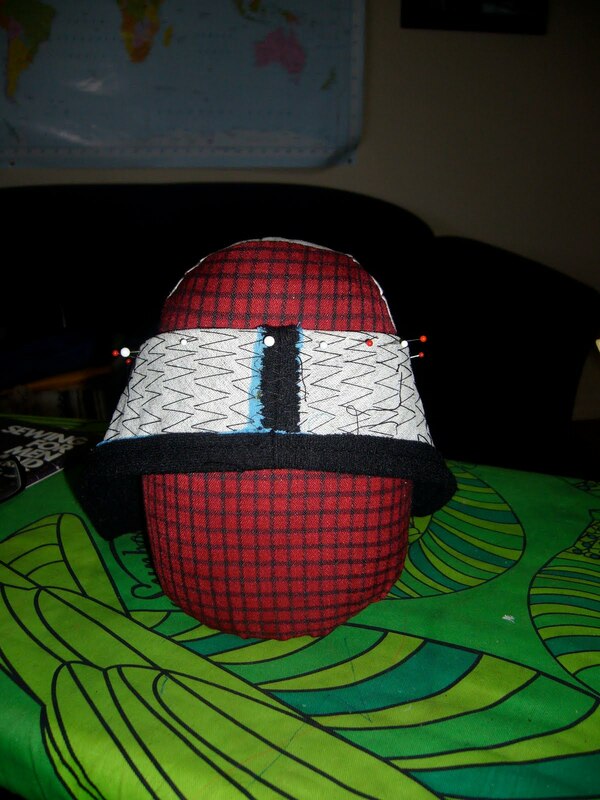 I’m rather put out I didn’t manage to save enough fabric for a hat. 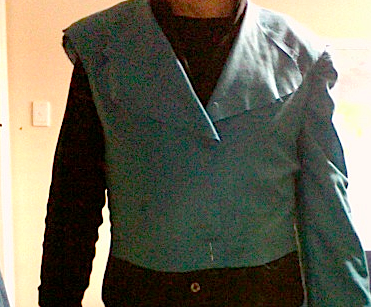 I’m still rummaging and piecing scraps together; we’ll see. 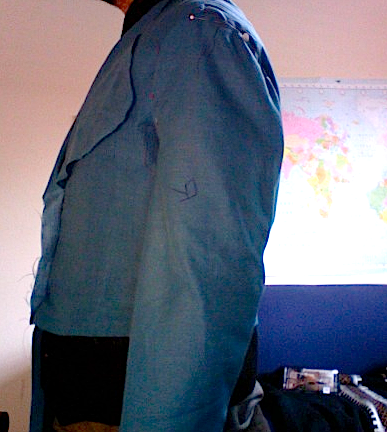 I feel like a genuine Depression-era seamstress… Bloody napped fabric. 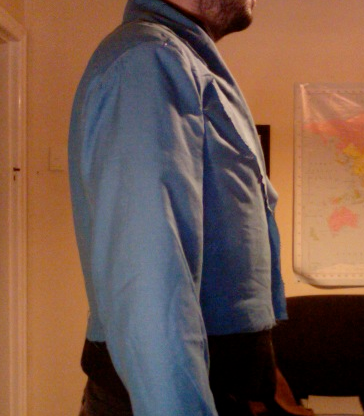 Bloody cut-on sleeves. 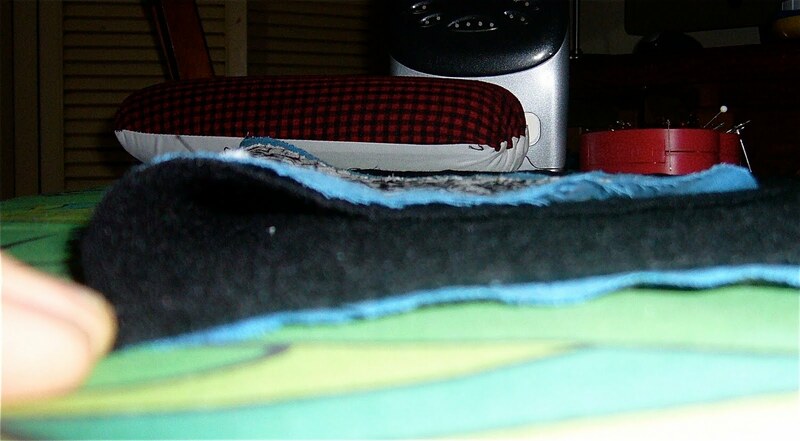 I like the plushy nap, I like the thick luxurious lining. It doesn’t look exactly how I pictured, but it’s fine. 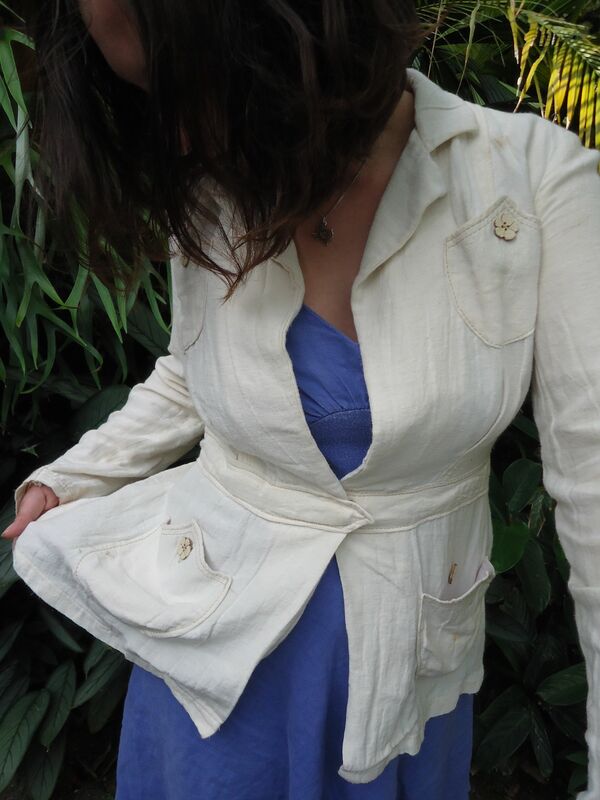 I want to make a second version of this (with some fitting fine-tuning) as a hip-length summer jacket to keep off the sun when I’m out and about. 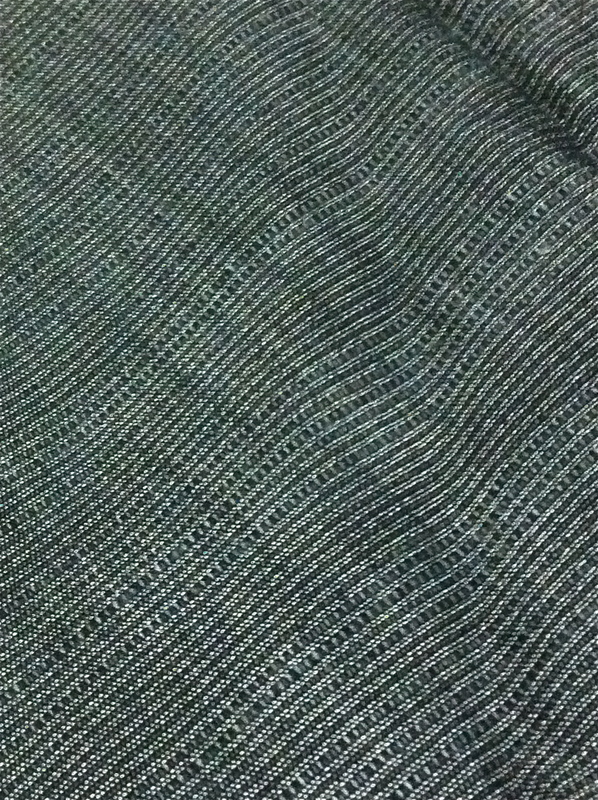 Textured hemp? 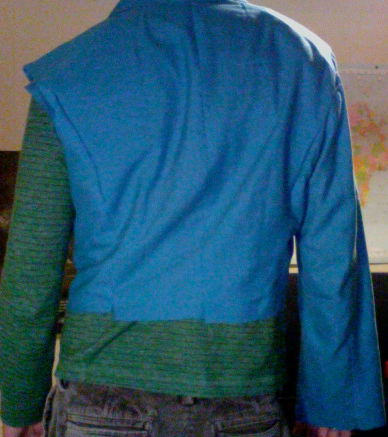 I thought to do it unlined, but I think the sleeves might stick if I don’t line. Hmm. That’s a few months down the track yet. 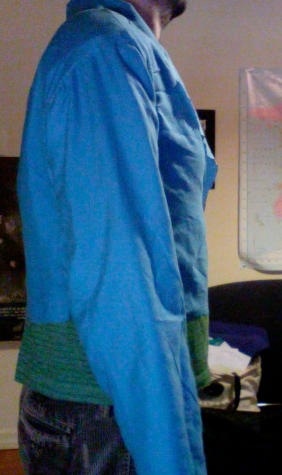 Next up- either a TNT blouse or my blueberry Parfait dress. Who can say? 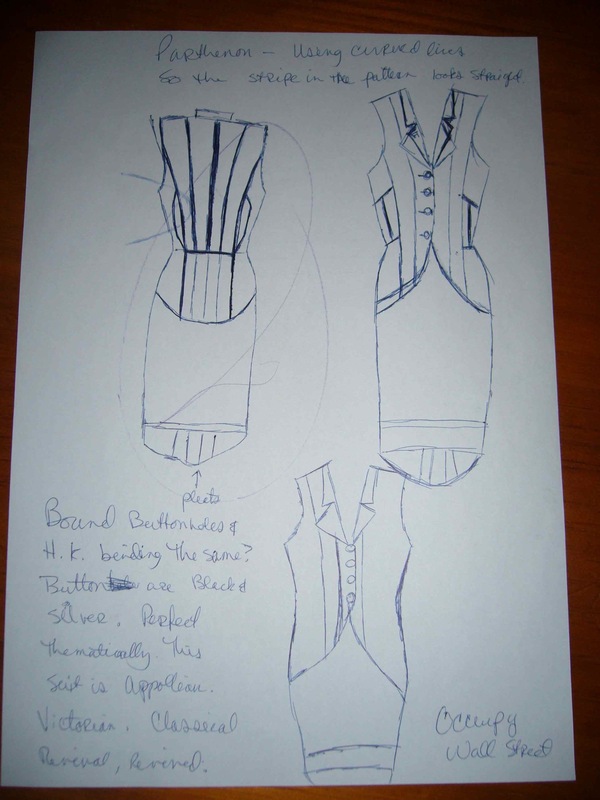 I’m still harboring delusions I’ll finish the wardrobe contest (with pics) in time. We’ll see!